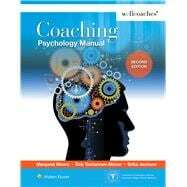 Prepare for Wellcoaches certification and your career as a health and wellness coach with Coaching Psychology Manual, 2e. Now in full color and, examples, and real-life scenarios, this comprehensive guide covers techniques and concepts for supporting clients in changing the behaviors and mindsets needed to thrive in all areas of wellness, including fitness, nutrition, weight, mind/body, stress, and management of life issues that impact well-being. Reviewed by the American College of Sports Medicine, the gold standard in credentialing health and fitness professionals, exercise and weight guidelines, sports medicine, ensures quality, currency, and accuracy. Examples of coaching dialogs, specific to the skills discussed offer additional insights and perspectives on effective coaching practices. Important! boxes draw attention to must-know information for facilitating productive and powerful client sessions. Don't forget... boxes highlight critical points to keep in mind while building relationships with clients. Review and discussion topics give you a chance to practice chapter concepts. Online instructor ancillaries include eBook and Image Bank.